Any bride and groom will tell you that their wedding day is one of the most important days of their lives. After the months spent planning the perfect day, the happy couple will have memories they will treasure and want to save. Weddings come with a host of keepsakes that require careful preservation in order for them to last as long as possible. With the proper care, your wedding photos, shoes, and gown can all be cherished and passed down for future generations to enjoy. Also, keep in mind that it is never too late to practice good preservation techniques on your family heirlooms. Family treasures can still be rescued from unsuitable display and improper storage and given new life. Today many photographers employ digital cameras to record wedding ceremonies. Digital files are an invaluable resource that can be copied and printed indefinitely. It is always a good idea to scan existing photographs into digital format. By having electronic copies of your wedding photos you can spare the original prints from over handling, giving them a longer life and being able to readily share through e-mails. However, it is important to keep in mind how quickly technology changes. While your digital prints may be easily accessible now, in ten years the technology to read them may be obsolete. (Think if ten years ago you stored your photographs onto a floppy disk) Keep up with new technology, and every few years create a new backup of your files and images. For the actual prints you do display, remember that light will fade photographs over time. Consider framing a duplicate image while keeping the original in storage. Photographs are also at risk of damage by temperature and humidity fluctuations. Too much humidity can make photos warp or stick to the glass of picture frames, it can also breed mold. Too little humidity can cause photos to roll or crack. Prints should be stored in acid-free folders in a cool, dry space. Cardboard in picture frames should be covered with acid-free paper to prevent leaching and discoloring of your photos. *Extra Tip: Label your important photos with dates, and the names of your friends. Of course you remember your wedding date, and the name of your maid of honor, but sixty years from now, when your grandchildren are going through your photos it helps them to have those names. Plus, there is a great connection seeing their grandparents handwriting. 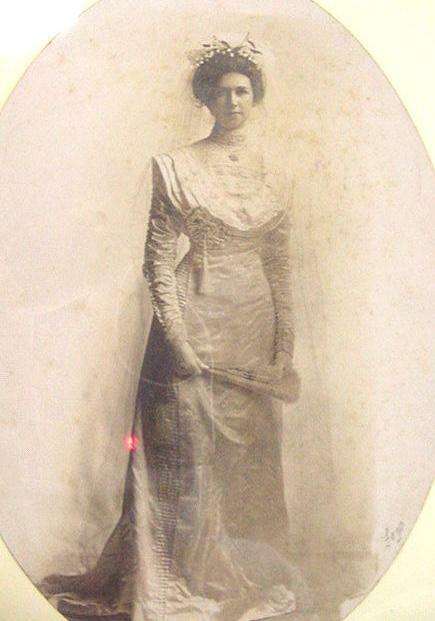 Finally, the dress, it is possibly the most important item of the wedding and the one that is surrounded by so many preservation myths. 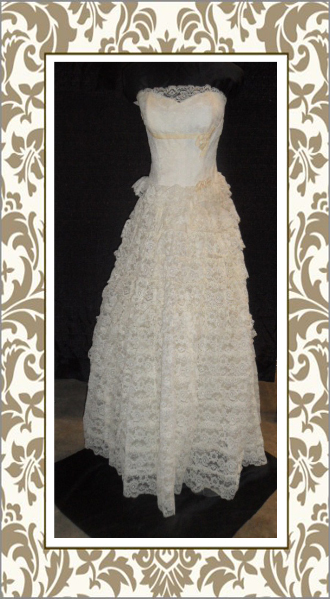 It is important to have your dress cleaned before settling into more permanent storage. Things like sweat, champagne and white wine may not show stains on the big day, but will become ugly brown spots years later. Take your dress to a reputable drycleaner. Let them know about any spots you may be concerned about and any particularly delicate parts of your dress. Make sure they do not use any starches or finishers or sizing chemicals, as these can yellow the fabric over time. Many drycleaners offer packing services, but this can be done yourself with a kit purchased online from Gaylord Brothers supplies or another archival materials supplier.First and foremost, like all artifacts, do not store your dress in the attic or basement! Keep it in the main part of your home, in a cool, dry place. This information may seem redundant, but it is singlehandedly the most important key to artifact preservation. It prevents mold, spotting, staining, warping or cracking of fabric and generally keeps the dress in much better condition. Secondly, the dress should be stored flat. Hanging puts pressure on the shoulders and neckline of the dress which can cause stretching or tearing. 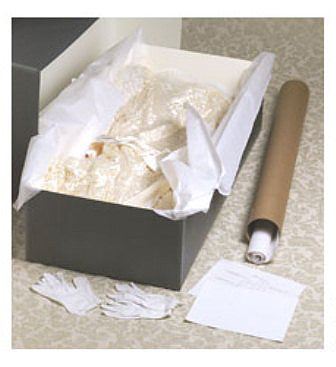 Preservation kits include a large acid-free box to store the dress. It used to be assumed that a cedar chest was an acceptable place to store a wedding dress (or christening gown or quilt). However, we now know that cedar wood transfers chemicals into the fabric of the dress and is not good for long-term storage. Boxing the dress protects it from overexposure to light and also insects and dust. The best way to keep insects away from your dress is to store it in a clean place. It is not safe to use mothballs. Most insects are not deterred by the chemicals at all, and they are generally not good for fabric. The darkness inside the box keeps the dress protected from light. Light can fade or discolor fabric, and also weaken the integrity of the cloth itself. Another myth about dress storage is that it is safe to seal the dress with tape or plastic. Unfortunately, sealing the dress is particularly unsafe for the gown. Sealing the plastic could trap in moisture which could breed mold. Also, plastics age over time and can discolor your dress. Finally, to properly store a dress it must be suspended in acid-free tissue. Textile preservation kits generally include instructions on packing a gown for long term storage. The important thing to keep in mind is to keep the dress comfortable. Use balls of tissue to puff up the sleeves, bodice, and skirt of the dress. It needs to feel pillowy; this is to prevent folds or creases in your dress. Over time these can cause permanent fractures or tears in the fabric. Wherever the dress needs to be folded to fit in the box you can place rolls of fabric to soften the folds. Dry cleaners often use blue tissue for its aesthetic appeal; however, the dyes in the tissue can stain your dress. It is best to use white, acid-free tissue from an archival supply company. Remember, it is never too late to rescue any dress or tux (suit) that was stored improperly. Bring it out of the basement and move it under the bed. Take it out of the cardboard box and put it in acid-free box. Remove any mothballs or blue tissue and replace it with proper materials. If properly cared for your wedding mementos can be kept in excellent condition for future generations.